Each year, millions of young people in our high schools, colleges, and universities are attracted to the study of mythology. Many of them are Christians. Mythology is an intriguing subject. However, the literature that rules this field today springs from an atheistic standpoint which skulks beneath the thinnest possible veneer of honest scholarship. The works of Jane Ellen Harrison, Joseph Campbell, and the many other authors who have bought into their erroneous assumptions are treated as insightful and brilliant. They presume to teach the meaning of mythology and its relationship to the history of humanity; however, the reality is that, like the scribes and Pharisees of Jesus’ time, their intellectual pride renders them blind to the obvious. The serpent convinced Eve that what God had said was not worth considering, and this same serpent’s viewpoint is what characterizes and unites these writings into a single dominating and deluding literary genre. Many of their facts are correct, but as they demean the truth of the book of Genesis, they shun the only context into which the facts sensibly fit. No matter how overt or substantial the evidence, atheist scholars, by definition, cannot conclude that the book of Genesis is a valid historical document. That is because validation of the truth of Genesis leads inevitably to validation of the reality of the God of Genesis. Thus, atheists must develop their own subjective, ambiguous, and convoluted explanations for the abundant ancient evidence that points toward the characters and events of Eden. As such, there is no cohesive foundation to their thinking. They are dogmatic, as opposed to being open-minded; sentimental, as opposed to being objective; and blind to truth, as opposed to being truly enlightened. Let’s take a look at their thinking and influence. Jane Ellen Harrison (1850–1928) was an avowed atheist and author of Prolegomena to the Study of Greek Religion and Epilegomena to the Study of Greek Religion and Themis. She made a name for herself in the fields of Greek mythology and anthropology by projecting her own brand of feminism onto the ancient world. Her work is especially revered in liberal arts colleges today. Ignoring Eve, Harrison wrote that the various mother-goddess images in Greek art pointed to an ideal and peaceful matrifocal (female-centered) society which preceded the Greek patriarchal system. Patriarchy, Harrison wrote, ‘would fain dominate all things, would invade even the ancient prerogative of the mother, the right to rear the child she bore … [it] usurps the function of the mother … .’1 As an example of this male usurpation, she cited the birth of Athena who emerged full-grown from her father, Zeus.1 As one who takes the book of Genesis seriously, I have no difficulty in seeing the full-grown birth of Athena out of a male god as a picture of Eve’s full-grown birth out of Adam. Harrison’s atheism blinded her to that possibility. If the patriarchal system was so anti-female, why then would the Athenians elevate Athena above all the other gods to the supreme heights of their city, and build her the most glorious temple in ancient Greece? The facts do not support a time when idyllic matriarchal cultures ruled. While there is plenty of evidence for goddess worship in the ancient world, there is next to none pointing to matrifocal societies, peaceful or otherwise. Harrison’s mother died shortly after she was born. Sadly, in her personal life, tragedy (repeating her own words) ‘invade[d] even the ancient prerogative of the mother, the right to rear the child she bore’. Thus, her yearning for a lost nurturing system ruled by women speaks more to what she missed in her own childhood than to any historical reality. Campbell’s influence has only grown in the intervening twelve years. More than twenty of his books (authored or co-authored) are still in print and offered for sale on Amazon.com. His erroneous thinking on the subjects of mythology and anthropology continues to pass for wisdom in our high schools, colleges and universities. A brief look at Campbell’s underlying assumptions will help us understand a revealing flaw at the very heart of his research and ideas. Figure 1. Sumerian seal resembling the account of the Garden of Eden. But this is exactly why it is Eden. This is the view of the events in the garden taken by Kain (Cain) and those who embraced his way. They defied and ultimately dispensed with the angry God, so He and His wrath are not going to show up here. There is no guilt because there is no sin; there is no sin, or falling short of the ideal, because, according to the line of Kain, Adam and Eve did the right thing in taking the fruit. In Genesis 3:14, Yahweh condemned the serpent to crawl on its torso and eat soil. On the Sumerian seal, the serpent rises to a height above the seated humans. Why? Those who hold to the belief system of Kain revere the wisdom of the friendly serpent who freely offers the fruit of the tree of knowledge, enlightening the two progenitors of all humanity so that they and their offspring might be as gods, knowing good and evil. One does not need an advanced degree in cultural anthropology to grasp this simple truth. These words belong at the beginning of Campbell’s book so that the reader might know his standpoint; but instead, they appear in the last chapter entitled ‘Conclusion’, implying that all that went before somehow backs them up. Campbell’s paragraph, above, does not represent a validly deduced conclusion from the facts; on the contrary, it is his biased set of unchallengeable assumptions out of which his study of mythology originates and through which it proceeds. These assumptions colour his choice of facts and the way in which he chooses to present them—thus, his irrational insistence that the Sumerian seal depicting the serpent’s side of Eden is no such thing. Campbell does not believe what the childish ‘babel’ of Genesis says about anything, including Eden, and is therefore his reason why the Sumerian depiction could not possibly represent it. He writes that the male figure (Adam) on the Sumerian seal is ‘the ever-dying, ever-resurrected Sumerian god who is the archetype of incarnate being’.7 Since Campbell is an evolutionist, shouldn’t his ‘archetype of incarnate being’ look less like a human and more like a tadpole, a monkey, or a knuckle-dragging apeman? While Campbell’s work teaches that Genesis and the rest of the Scriptures are basically irrelevant, the more important question remains, how do the Scriptures define his belief system? As Campbell is systematic in his opposition to the central tenet of Christianity—Christ’s resurrection from the dead—his teachings are those of an antichrist, many of whom, according to 1 John 2:18, have come out into the world. Some of his followers may reason that Campbell is not anti-Christ because he says that Christ’s most important teaching is ‘love your enemies’, and then encourages his followers to do that by removing the motes in their eyes.15 But the original meaning of ‘anti’ in Greek is not ‘against’ but rather ‘instead’. Instead of Christ Himself, Campbell offers one of Christ’s sayings which he misappropriates into his own atheistic framework—almost anything instead of Christ will do, including some of Christ’s words taken out of context. Scores of authors have followed the alien paths carved out by Harrison and Campbell in their own books and have thus been drawn into wasteful pseudo-intellectual excursions of their own. I have mentioned the work of Barbara G. Walker, above. Lady of the Beasts by Buffie Johnson is another book among many which shows how the teachings of Harrison and Campbell have been picked up and spread. Besides the name of a special friend, Campbell appears first in Johnson’s acknowledgements, and Harrison is cited often. In her book, Johnson features seventy pages devoted to the serpent in the ancient world. Over and over, she stresses the importance of the serpent: ‘The serpent was venerated throughout ancient Egypt … . Reverence for the snake in the Near East equaled that found in Egypt … . The Minoans like the Egyptians had not been conditioned to see in the snake a symbol of evil … ,’ etc.16 She concludes, ‘At the dawn of literate time, therefore, the serpent appears as a supreme figure guarding the Tree of Life and the Tree of Knowledge’.17 Over and over, she points to the connection between a woman, a tree, and a serpent; but she cannot see the Genesis connection. That is because her standpoint is based on that of Campbell, Harrison, and other atheists. Note that she does not say that archaeologists have disproved it, or refuted it, but have denied it. All atheists must deny the possibility of an Eden, and Johnson is no exception. Atheists must deny every bit of evidence that suggests or points to a Creator God; and likewise, they must deny all the evidence that points to the inextricably related idea that the book of Genesis is a true account of human origins. Their denials are a matter of atheistic dogma, not of science or of logic. Figure 2. 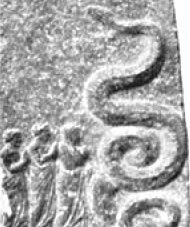 Ancient Greek relief depicting serpent worship. The irony, of course, is that even as they maintain that the early events of Genesis have no real meaning for themselves or the rest of humanity, they embrace and exalt the ‘wisdom’ of the Genesis serpent. While God has instructed us to subdue ‘every living animal of the earth’ (Genesis 9:2), they look up to a wild beast as a source of knowledge for mankind. This is the true abomination, for ‘what is high among men is an abomination in the sight of God’ (Luke 16:15). In Prolegomena, Harrison features an ancient Greek relief of a woman and two men worshipping the serpent (Figure 2). Campbell copied it into his Occidental Mythology. Do we see these authors in this picture? How naïve the sophisticates have become! Campbell did not even believe that God exists. How could such a man possibly offer any edification at all to the body of Christ? And what kind of ‘faith’ is Moyers talking about? The only faith Moyers shows by touting Campbell’s work is faith in the serpent’s ability to undermine the Word of God and delude mankind. As an experienced journalist who claims to be a Christian, it is unacceptable for Moyers to present Campbell’s disguised atheism and idolatrous fervour to the public as academic brilliance. It was astounding to learn that, to him, the greatest sin was the sin of ‘inadvertence, of not being alert, not quite awake’.20Asleep to the truth himself, Campbell found in Moyers an unthinking enthusiast willing to sleepwalk through his own spiritual life, unwittingly perpetuating spiritual fraud upon young minds. The works of Harrison and Campbell, aided by Bill Moyers’ promotion of Campbell, have generated an atheistic genre which now dominates mythology literature. The works of these authors are part of a trap laid by the Adversary, a barricade on the road to truth. The serpent’s voice defines and permeates their writings, saying again and again in a hundred different ways, ‘The Scriptures are not true, God does not exist’. He is comparable to the beasts that are dumb. And of those after them, who approve of their mouthings’ (Psalms 49:12–13). All that today’s respected mythologists have proven conclusively is that ‘the wisdom of this world is stupidity with God’ (1 Corinthians 3:19). As atheists, these mythologists eagerly embrace and teach Darwinism. On this basis alone, their books should be rejected: they trace back the origins of their own vaunted intellects, after all, to chance mutations from primordial ooze. Robert Bowie Johnson, Jr is a graduate of the United States Military Academy at West Point with a degree in general science, and an airborne, ranger infantry veteran of the Vietnam War. He is the author of Athena and Eden: The Hidden Meaning of the Parthenon’s East Faςade and Athena and Kain: The True Meaning of Greek Myth. 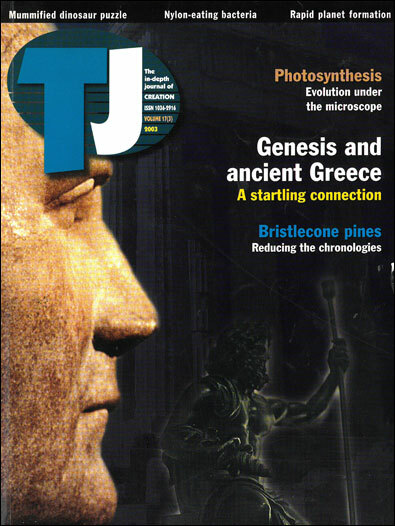 Johnson is currently at work on a book and film documentary called The Parthenon Code, which will include computer-generated reconstructions of the sculptures of Athena’s famous temple. He is also the vice president of Solving Light Books in Annapolis, Maryland. Return to text. * Bible quotations are from the Concordant Literal Translation. Harrison, J.E., Epilegomena to the Study of Greek Religion and Themis, University Books, New Hyde Park, New York, p. 495, 1962. Walker, B.G., The Woman’s Encyclopedia of Myths and Secrets, Harper & Row, San Francisco, p. ix, 1983. Walker, Ref. 3, p. viii. Snyder, T., Myth perceptions, Joseph Campbell’s power of deceit, Answers in Action, p. 1, <www.answers.org/CultsAndReligions/Campbell.html>. ‘About Joseph Campbell’, The Joseph Campbell Foundation website, p. 1, <www.jcf.org/about_jc.php>, 2003. Campbell, J., The Masks of God: Occidental Mythology, The Viking Press, Inc., New York, p. 14, 1964. Campbell, Ref. 6, p. 520. Campbell, J., with Moyers, B., The Power of Myth, Doubleday, New York, p. 56, 1988. Campbell, Ref. 8, p. 107. Campbell, Ref. 8, p. 24. Campbell, Ref. 8, p. 47. Campbell, Ref. 8, p. 62. Campbell, J., The Inner Reaches of Outer Space: Metaphor as Myth and as Religion, Harper and Row Publishers, New York, p. 17, 1986. Campbell, Ref. 13, p. 18. Campbell, Ref. 8, p. 211. Johnson, B., Lady of the Beasts: The Goddess and Her Sacred Animals, Inner Traditions International, New York, pp. 132, 136, 129; 1994. Johnson, Ref. 16, p. 191. Johnson, Ref. 16, p. 184. Campbell, Ref. 8, p. 55. Campbell, Ref. 8, p. xvii.